Yayasan Tenaga Nasional is working with Majlis Amanah Rakyat (MARA) to select students with potential to become future scholars and industry leaders. Here, students are given exposure on the TNB Integrated Learning Solution. KUALA LUMPUR: Preserving nature is an integral component of ensuring the sustainability of the Earth. 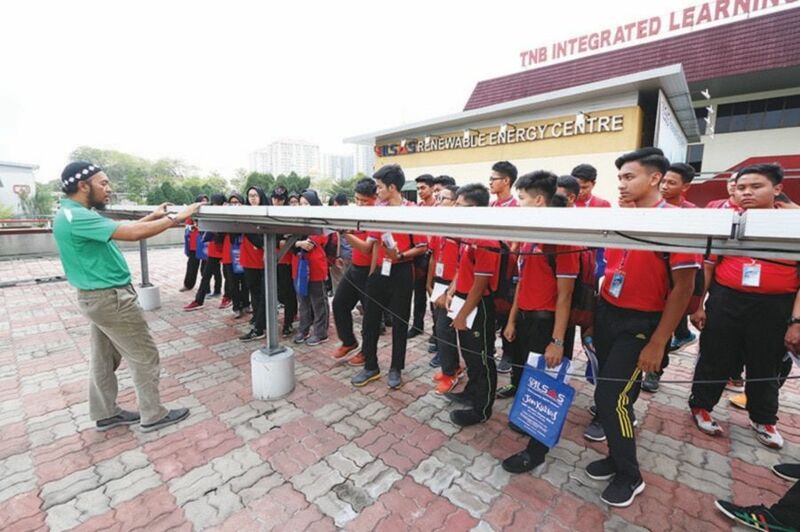 In an effort to achieve the aims of National Transformation 2050 (TN50), Energy, Green Technology and Water Ministry (KeTTHA) is using the phrase ‘Jom Lestarikan Alam Kurniaan Ilahi’ to nurture the mindset of the young generation towards playing their part in a consistent and sustainable development of the country. KeTTHA, in collaboration with Tenaga Nasional Bhd (TNB), organised a TN50 Green and 2030 sustainable development dialogue at Kolej Universiti Islam Antarabangsa Selangor (KUIS) recently. This was done to explain the ministry’s Green Technology Master Plan (GTMP), as well as the role of the government and society in promoting a greener lifestyle. The programme attracted more than 1,400 participants, including students from higher learning institutions, and workers from the public and private sector. During the dialogue session, KeTTHA secretary-general Datuk Seri Dr Zaini Ujang said preserving nature involved planning developments that would protect the environment and not cause natural disaster, damage to the surroundings as well as erosion. He said each individual needed to change his mindset so that an environmentally-friendly culture could be inculcated and spread to the community. “An environmentally-friendly practice involves the prudent usage of energy in daily life, based on two pillars which are water and electricity, as both are inter-related,” he said. He said this programme would help society change its lifestyle and conserve natural resources,” he said. He said in gearing the nation towards TN50 Green, three main elements that needed to be strengthened were sustainable development, a clean environment and socio-economic development. Based on the TN50 Green‘s objective of achieving sustainable development, KUIS has declared its campus as a low- carbon campus beginning this year. KUIS Postgraduate Centre director Dr Mohd Farid Ravi Abdullah said the college would play its part to make this mission a success. He said other higher learning institutions could emulate KUIS so that the TN50 aspirations and GTMP goals could be fulfilled. “KUIS has taken the steps to educate the students and staff to change their daily lifestyle, especially when it comes to electricity and water consumption,” he said. “As mentioned during the dialogue session, even the ablution before Muslim prayers only requires less than 0.2 litre of water,” he said. A TNB employee explaining solar energy. He said when everyone embraced this change, only then can this mission be fulfilled. Norsuzienah Halil, 22, an Environmental Chemical Engineering Technology undergraduate student, said the TN50 Green and sustainable development programme could spur the younger generation to take care of the environment. “I learnt a lot during the dialogue session. I was not aware that all the resources could be depleted if we do not take the effort to conserve them now,” she said. A diploma student in communication, Muhammad Hasamudin Abdul Samat, 21, said the programme was a platform for the top management to engage the youth and exchange ideas. “It looks easy but it requires determination to follow the TN50 guideline to achieve the aspiration of sustainable development,” he said. KeTTHA will embark on a national roadshow in Pahang, Perlis, Kedah, Penang, Perak, Negri Sembilan, Malacca, Johor and Sarawak. This is in line with GTMP‘s vision to develop the green technology industry for sustainable development and economic growth.